When I imagine the Neolithic, I see people living in villages, farming, herding, hunting in the woods, dancing at harvest festivals, having babies and burying their dead, on and on for thousands of years, little changing from one century to the next. Thinking about the signs of cannibalism at the German site of Herxheim, I realized that this can't be quite right. 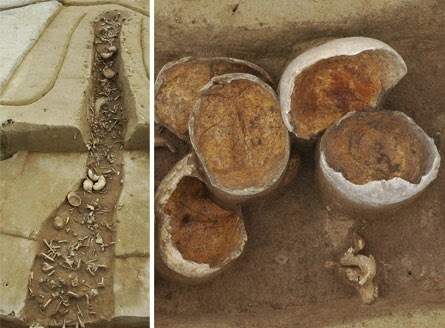 Evidence is mounting that dramatic events took place in Neolithic Europe, and the 500 bodies from Herxheim may well be the remains of one of them. 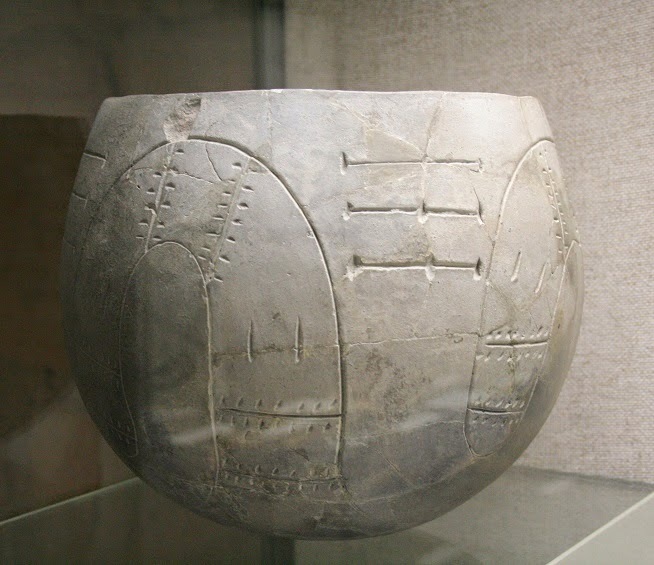 Herxheim was a settlement of the Linearbandkeramik (LBK or Linear Pottery) culture, the first farmers in central Europe. The LBK was founded in Hungary and Bohemia around 5500 BCE by immigrants from the Balkans, and it then spread across modern Austria and Germany to France and the Low Countries. Herxheim was founded around 5300 BCE. As the plan above shows, only part of the site was excavated (because it was in the way of a new industrial park). Archaeologists later came back to do some more work, but they found that the eastern end seems to have eroded away.The settlement was surrounded by a double ditch, which did not look deep or wide enough to provide much defense. The ditch is unusual, and suggests that from the beginning this was a special place. Besides the ditch, though, the settlement looks pretty ordinary through most of its history. But at the end of its history, for a period of no more than 50 years and possibly much less, Herxheim was transformed into something else. After about 4950 BCE the ditches were no longer cleaned out, but were intentionally filled in. And not with dirt -- they were filled with a mixture of human bones and artifacts, obviously the remains of great rituals. The pottery did not all come from Herxheim; there are several varieties, some apparently from sites 400 kilometers away. Herxheim must have been some kind of regional center, drawing people and offerings from a wide area. Both the bones and the artifacts had been ritually "killed" before they went into the pit. The pots were smashed, and all sorts of strange things were done to the bones. Among other things, facial bones were smashed beyond recognition, “giving an impression of the destruction of individual identity, a kind of psychic violence against the person." Bone modifications indicate that the human individuals were first butchered. For this stage, the analogy between the treatment of the bodies and typical butchery techniques is very well illustrated by the systematic destruction of the transverse processes on thoracic vertebrae on the one hand, and of the posterior parts of the ribs (head, neck and tubercle) on the other hand. This pattern is quite similar to the technique used to separate the ribs from the vertebral column observed in animal butchery. After this, heads were skinned following a recurrent pattern: a long incision was made from the root of the nose to the nape of the neck in order to cut the scalp and pull it aside. Then the temporalis muscles were removed from the cranial vaults and the skulls were broken, perhaps to extract the brain, but carefully so as to preserve the vault. Cut marks and scrape marks on the lingual surface of the mandible show that the tongue was also cut out, while separation of the skull from the mandible caused further marks on the anterior and posterior edges of the ramus. Regarding other parts of the bodies, the long bones of the limbs were intensively defleshed and their marrow cavity exposed, probably by a hammer-on-anvil technique. Processing for marrow is also documented by the presence of scrape marks in the marrow cavity on two fragments. All these observations are similar to those observed in animal butchery. Their verdict: all of these people were eaten. Whatever happened at Herxheim, it happened in a restricted period at the end of the occupation, perhaps only a few years. Boulestin and company think this is the remains of some single event, perhaps a great war. I find this argument compelling; a thousand bodies is a lot for these small-scale societies. They connect the war to a dramatic decline in the population of Europe, by a third or more, that seems to have taken place at the end of the early Neolithic. The general explanation for this fall-off is that the initial Neolithic settlement of Europe took place in an unsustainable way. The way early Neolithic people lived put too much stress on some key resource -- fertile soil, perhaps, or wild game -- so once the continent was full the human ecosystem teetered on the brink of catastrophe, and all it took was a few bad harvests to push the whole society over the edge. Such a collapse is not likely to have happened in a peaceful, orderly way. Perhaps it led to terrible wars, and perhaps those wars were driven in part by the need to find victims for human sacrifice. The gods must have been very angry to visit such destruction on the people, so they needed appeasing on a grand scale. Herxheim is not the only site of this period where such strange deposits of human bones have been found. 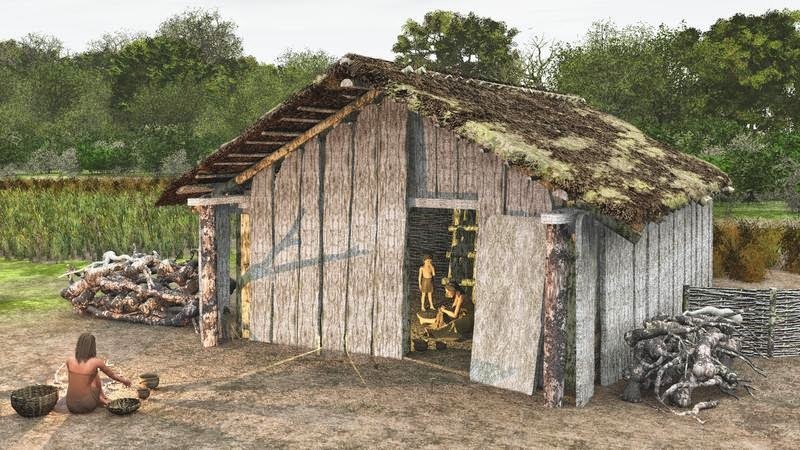 Possible victims of human sacrifice and cannibalism have also been found at Talheim and Vaihingen in southwestern Germany and in the Virgins' Cave in Bavaria. At Asparn-Schletz in Austria the bones were found in a ditch, just as at Herxheim. The meaning of all this is disputed, and some archaeologists do not accept the theory of mass human sacrifice. But I believe it is the most likely explanation, and its coincidence with the population decline argues for a widespread, traumatic event. A lot happened in the distant past. We may have trouble recollecting those distant days, but if we work hard enough at it we may be able to resurrect some of the events that dominated peoples' lives long ago. The key source on Herxheim is: Bruno Boulestin, Andrea Zeeb-Lanz, Christian Jeunesse, Fabian Haack, Rose-Marie Arbogast, and Anthony Denaire. Mass cannibalism in the Linear Pottery Culture at Herxheim (Palatinate, Germany). Antiquity 83(2009):968-982. To be fair, a butchered corpse doesn't necessarily indicate the flesh was consumed - at least not specifically by people. After all, there are today extant rituals where corpses are cut apart to be fed to vultures and other carrion birds. 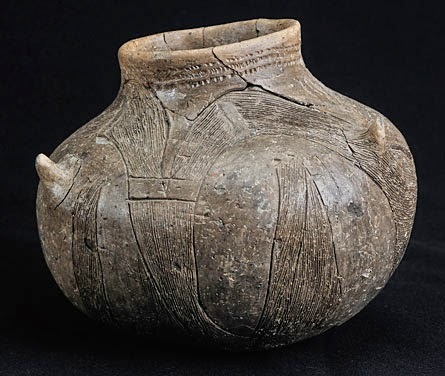 In the absence of further evidence - such as bite marks on bones, or perhaps depictions of human consumption of the flesh on pottery - is it not just as plausible that the butchered individuals were put to other uses? Perhaps the sacrificed were fed to sacred animals, or to the gods or spirits themselves in any number of forms? Offerings of butchered flesh could be made to the land for fertility. Or the butchering might have been a form of insult or obliteration, seeking to devalue and dehumanize the sacrificed by treating them as lesser beings, subjecting them to practices associated with mere animals. The fact that they employed "typical butchery techniques" might even reinforce that very notion - especially when combined with the degree of violence displayed to the corpses in other aspects, such as the brutally smashed facial bones. I could easily imagine a situation such as a surrendered army being slaughtered, butchered, and their flesh delivered back to their loved ones one trays as a horrible mockery. Or perhaps just fed to the dogs, in the style of the Old Testament? Of course, none of this is to say that there's much evidence against cannibalism here. I just feel that it is premature to absolutely conclude it was cannibalism based purely on butchering alone. As I said above, a gnawed bone or some form of depiction of consumption would clinch it for me. Moreover, direct proof of this could be provided by the existence of chewing marks. From a morphological point of view, they are perfectly compatible with a human origin, but their characteristics do not allow us to exclude the actions of carnivores, especially dogs (Landt 2004). On the other hand, their distinctive distribution (10 cases out of 16 are situated near the broken ends of metatarsals, metacarpals and phalanges of the hands, and 3 on the olecranon process of the ulna) speaks strongly in favour of human choice rather than more or less random action by carnivores. If you're on academia.edu you can get the whole article. I very much appreciate the additional info and citation! That said, I'm still not sure anything truly definitive has been established. I've kept dogs, and if you throw them a pre-split bone, they chew at the point of the break, not at "more or less random" spots. Unsplit bones? Sure, they bite all over because they're trying to find the weak spots to break them. But if so far no one can rule out "the actions of carnivores, especially dogs", then it still seems just as likely to me that they tossed broken bones to their dogs as it is they ate the marrow themselves. Especially with only sixteen cases of bite marks, which my admittedly amateur intuition would suggest is an awfully low number given hundreds of corpses. Either way, it's fascinating, if perhaps a bit macabre!